Hearty, beefy, stick to your ribs DELISH! 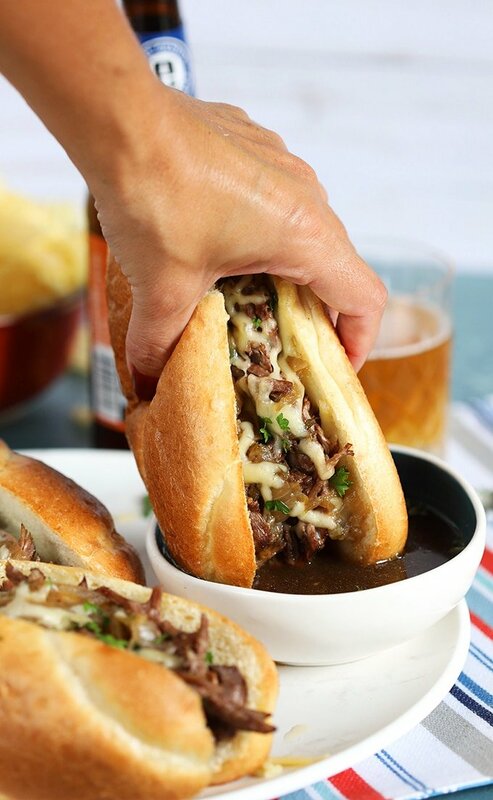 This Slow Cooker French Dip Sandwich couldn’t be easier to make. 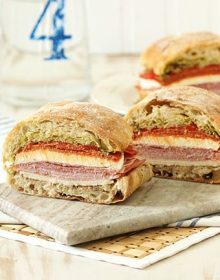 Cooked low and slow for hours in a beefy stock loaded with herbs, spices, onions and BIG flavor, tender beef is the centerpiece for one epic sandwich. October is here and with it comes my craving for all the comfort foods. All of them. Like hearty sandwiches and cheesy casseroles. They’re like a fluffy sweater for my insides if you know what I mean. 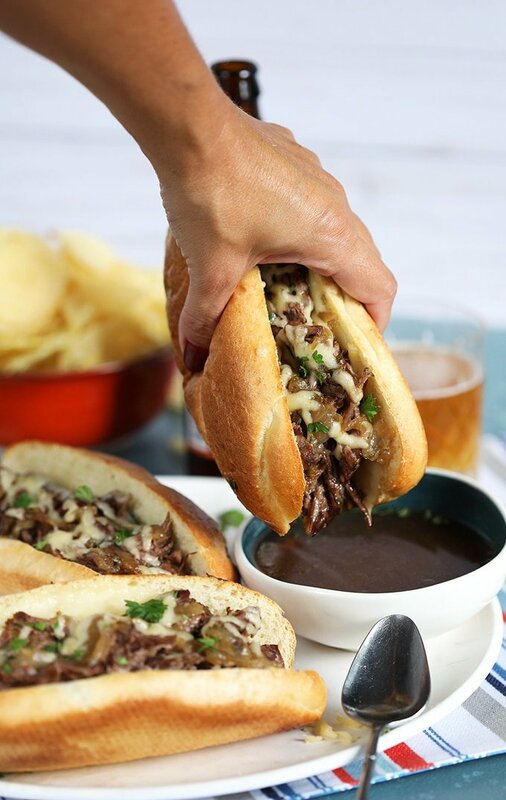 The cold weather hasn’t even hit yet and I have a hankering for things like this Slow Cooker French Dip Sandwich. Since I’m trying to get better with planning dinners that don’t require the whole family huddling around a cake at the dinner table (I’m only a little ashamed), I dusted off my slow cooker and decided to get things started in the morning. I love slow cooker meals especially easy recipes like this Loaded Baked Potato Soup. 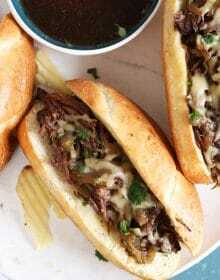 I even have a whole round up of slow cooker recipes that I collected over the years so dinners are never boring and now I have this amazing Crock Pot French Dip Sandwich to add to the list. It’s loaded with shredded beef and melty onions so each bite is melt in your mouth amazing. What is a French Dip Sandwich? What kind of meat is used for a French Dip? To make your Crock Pot French Dip, be sure to choose a well marbled cut of beef that can withstand the lengthy braising time. I like to use a chuck roast that’s been trimmed of excess fat (to keep the au jus from being overly fatty). How do you make a French Dip? 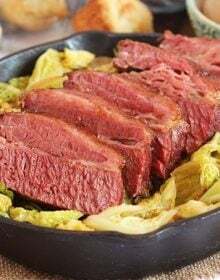 You can make your French Dip in the oven in a dutch oven but this recipe is for a Slow Cooker French Dip Sandwich. So, dust off the crock pot and follow these steps. Trim your roast of excess fat and season liberally with salt and pepper. Heat oil in a large skillet over high heat. Add the roast the to pan and brown on all sides. Transfer the roast to the slow cooker or crock pot. Add sliced onions and herbs to the slow cooker. 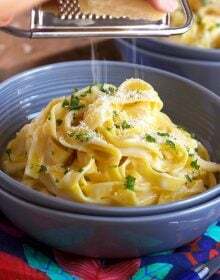 In a large mixing bowl, whisk together the beef stock, mustard, Worcestershire sauce, wine, garlic, salt and pepper. Pour the stock over the beef and cover with the lid. Cook the roast for 4 hours on high or 6 hours on low, or until the roast shreds easily with a fork. 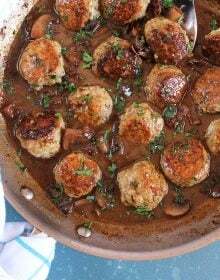 Remove the roast from the slow cooker and shred into bite sized pieces. Fill a long roll with the beef and top with shredded cheese. 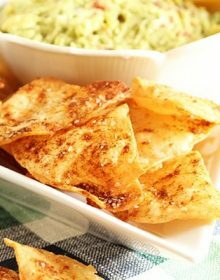 Serve with a side of the cooking liquid as the dip. See how easy that is? You can put it all together before you leave for work and have dinner waiting for you when you get home! 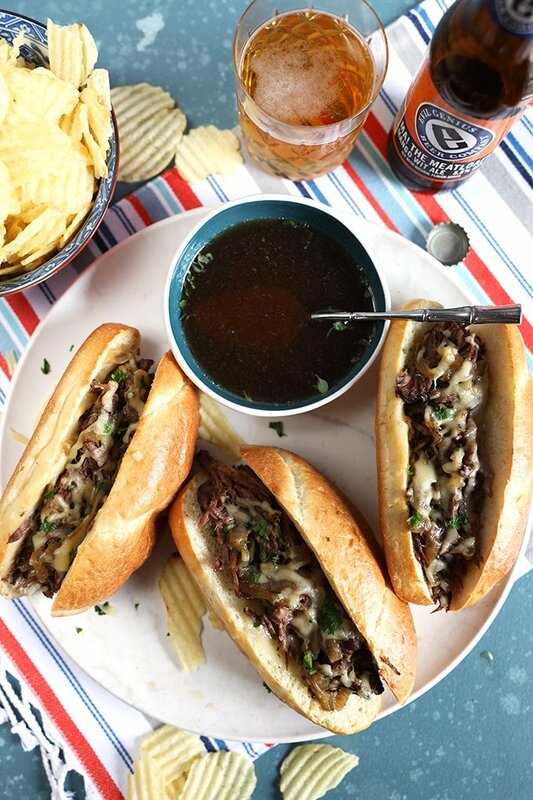 How do you make au jus for French Dip? 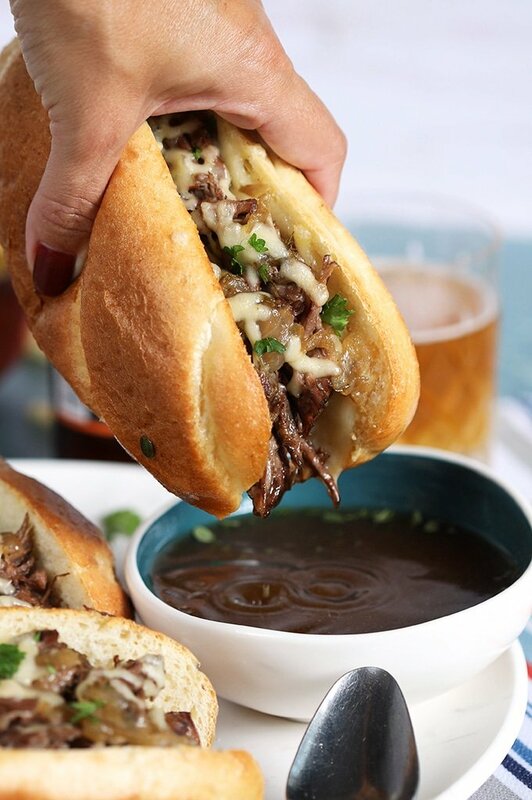 It’s so easy to make the au jus for French Dip in your slow cooker because the cooking liquid, essentially, becomes your au jus….or dip. 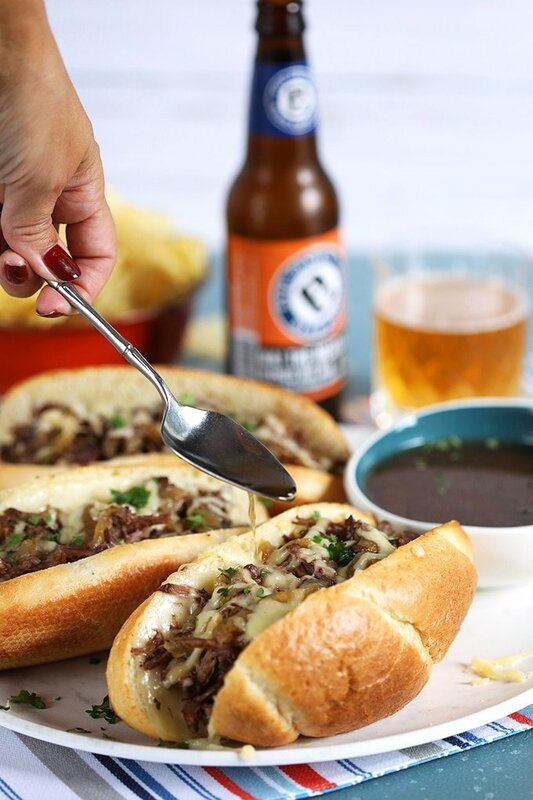 Simply remove the beef from the slow cooker, ladle the au jus into a bowl and serve it with your French Dip Sandwich. What kind of cheese is in a French Dip Sandwich? The sky’s the limit here, friends. I like to use a combination of provolone and Swiss cheese because they both melt fantastically and the sharp bite of both cheeses is a great contrast to the bold beef flavor of your easy French Dip Sandwich. If you’re not a Swiss fan, you can totally use cheddar….also, equally amazing or a milder choice would be mozzarella. 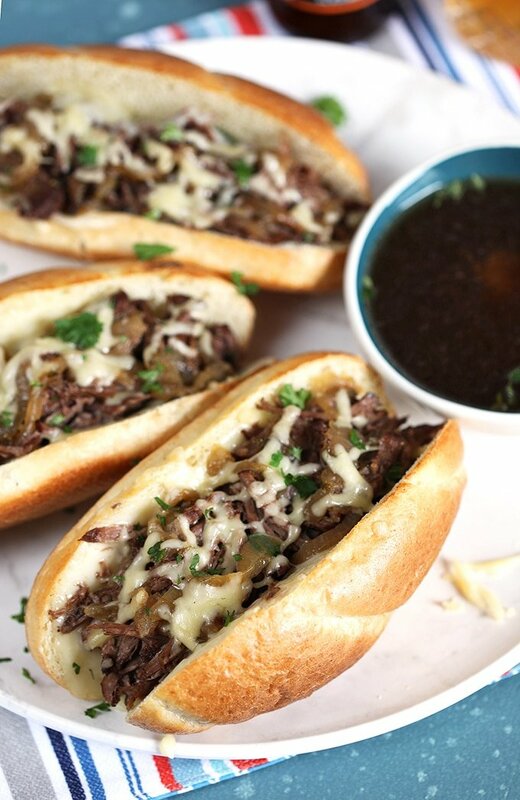 To make the BEST French Dip Sandwich ever…..I like to place a slice of provolone in the bottom of the roll and THEN top with the beef….and THEN sprinkle with shredded Swiss cheese. AND THEN I pop it under the broiler for a couple minutes to make everything all melty and magical and amazing. 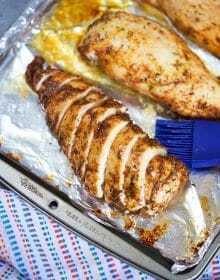 If you’re looking for more slow cooker sandwich recipes you have to try this Slow Cooker Philly Chicken Cheesesteak or one of my all time favorites (and popular on Pinterest) Italian Roast Pork Sandwich which is just like the one you find at Dinic’s in Reading Terminal Market. Maybe better! Or….if you’re a burger fan, you definitely need to sink your teeth into THIS French Dip Burger…..it’s insanely amazing. No joke. Want to see what else we’re cooking up? Follow us on Instagram! 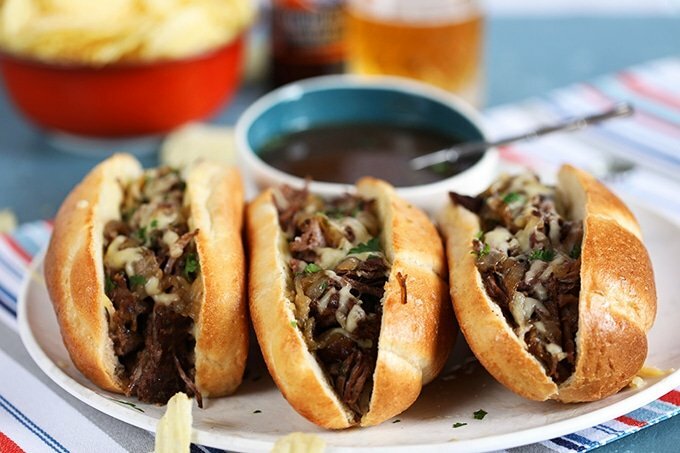 Hearty comfort food, these Easy Slow Cooker French Dip Sandwiches are simple and magical. Trim the excess fat from the chuck roast. Season liberally with salt and pepper. Heat the olive oil in a large skillet over high heat. Add the chuck roast to the pan and cook for 4-5 minutes until brown. Flip the roast over and brown on the opposite side, approximately 4-5 minutes. Continue to flip and cook the roast until all sided are browned. Transfer the roast to the slow cooker. Place the onions and garlic on top of the roast. Whisk together the stock, wine, mustard, Worcestershire sauce, salt and pepper. Pour the stock mixture over the beef. Add the thyme and bay leaf. When the roast is fork tender, transfer to a serving platter. Skim the excess fat from the top of the stock mixture with a spoon. Arrange the beef in long rolls and top with cheese. 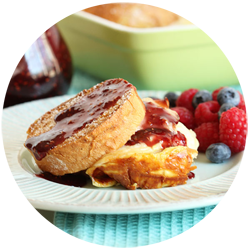 Serve the sandwiches with bowls filled with stock (au jus). 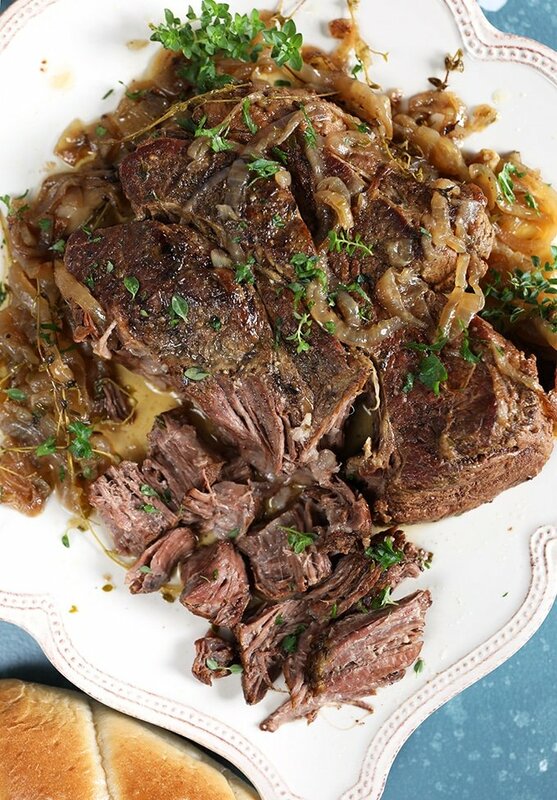 Leftover beef and au jus can be frozen in an airtight container for up to 4 months. To reheat, warm in the microwave or place in an oven safe pot and thaw in the oven until warmed through. Oh, these were magnificent! Best French dip sandwiches I’ve made! 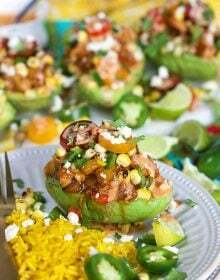 What a great crock pot meal! We have been in love with french dip wraps that are made in the oven. 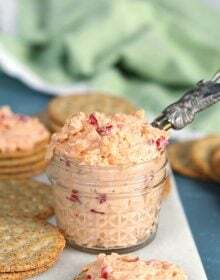 A good crusty roll with this crock pot mixture would definitely be irresistable! 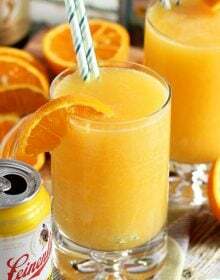 My husband LOVES these! So good!